I was cleaning out some of the 900 photos and movies on my iPhone when I realized, "Hey, these kind of tell the story of my year of playing, reporting and writing about video games." These might be fun to share. I didn't use my iPhone to take photos of things I wanted to publish. I used it more as a notebook, snapping a quick photo or making a video or screencap to document something I wanted to remember. Most of the time, the camera wasn't taking good enough photos for what I'd need for the site, but sometimes, it had to suffice. January 2: Screencap of the first game I played all year: Hundreds. 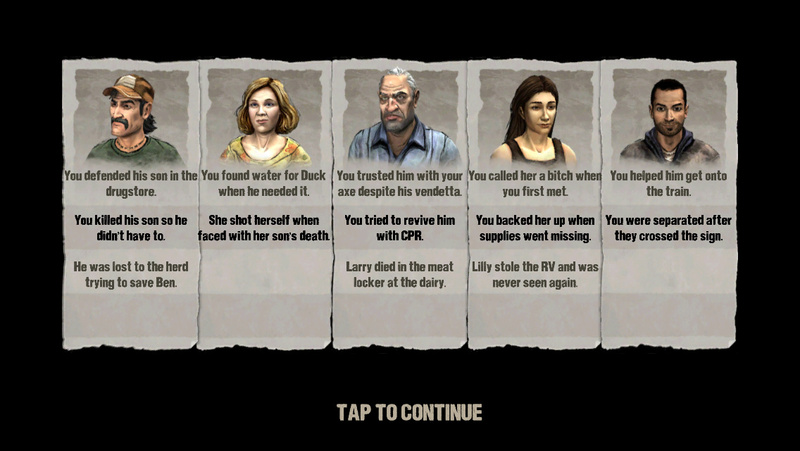 January 6: I took a screencap of one of the final screens in The Walking Dead, showing the choices I made. I'm hiding this one behind a link, for, you know, spoilers' sake. January 23: I thought we might have had our hands on developer documentation for the then unannounced PS4 and needed to ask around to make sure. Turns out that we did. January 29-31: I became obsessed with Fire Emblem: Awakening, which I was fortunate enough to get to play early thanks to me getting an advance copy of the localized edition from Nintendo. I don't remember why I took a photo of that moment in the game. But I do remember all the crazy texts Kirk Hamilton I were sending each other about our adventures. We were obsessed with the game. February 7: The annual DICE convention and a speech by Gabe Newell. Happily, we had it covered. There was a great speech about the "graying of gaming" by Warren Spector, too. February 12: Two things. First, a taxi ad for Metro Last Light, a game that was in limbo at the time. This ad still bore the logo of the defunct THQ. On the same day, I snapped another photo of Fire Emblem, either to remark about the missing feet or the apparent reference to the old Commodore 64 game Impossible Mission. February 20: PS4 reveal day. First, getting ready to shoot a pre-show with Game Informer's Andy McNamara, Revision 3's Adam Sessler, Giant Bomb's Jeff Gerstmann and Spike/GT's Geoff Keighley (not pictured). And then... freezing outside, waiting to get into the event. March 9: Grabbing a photo for a Tweet about a story I did for The New York Times about Sim City, a game that did not come together as planned. March 12: For the first time in my decade of covering video games, I had a live (video conferenced) interview with people in Nintendo's HQ in Kyoto. The interview was about the then-forthcoming Luigi's Mansion: Dark Moon. The Nintendo Japan guys were in the bottom left. Members of the Canadian team were in the top left, but were in San Francisco. A translator from Nintendo's Washington State offices was in the top right. I was in New York. The interview went well. March 23: The madness and splendor of a PAX East! April 17: I took some rare time off for a week in April. I happened by this graffiti in Brooklyn. The lady did not jump up and punch the coin blocks, sadly. May 3: Sign of the times? I discovered that the GameStop closest to Kotaku's NYC offices and pretty much across the street from Rockstar was no more. Good news for fans of yogurt, I guess. May 6: Another Nintendo video conference, this time with the lead creators of the newest Animal Crossing. May 14: The so-called pre-E3 tour gives reporters and critics access to some game creators and their work about a month before E3. At the Activision leg of the tour, I could (and did) interview people behind Call of Duty: Ghosts in this trailer. There was also a Destiny trailer, but maybe just for show? No interviews, as far as I can remember. May 16: Still on the pre-E3 tour. I saw a lot of PS3 and Vita games, but, as the deal goes with early access to this stuff, couldn't cover the demos I got of several of them until certain dates and times. May 21: The big Xbox One reveal day! First, the huge tent where the stage show took place. Next, former Xbox boss Don Mattrick (in suit) working the crowd while his chief of staff Aaron Greenberg stood nearby. Finally, the machine itself, garnering a lot of attention just moments after being revealed. 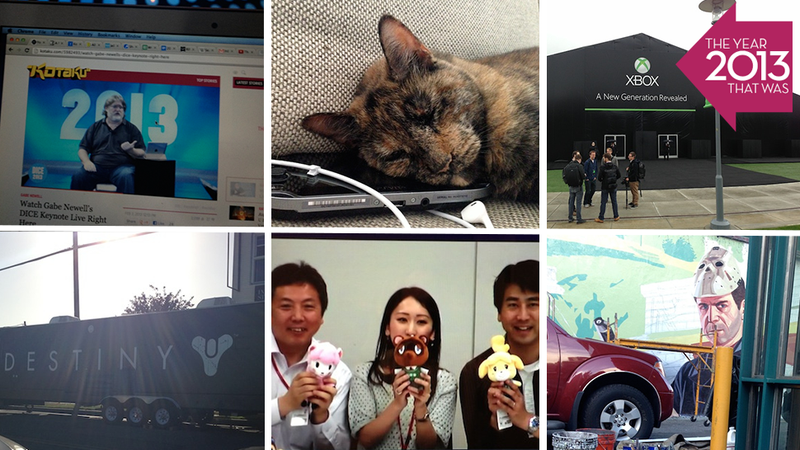 August 30: I already deleted all my photos from E3 in June and I don't think I had anything in July. So to August we go with something much closer to home. My cat Quimby. My Vita. September 15: Two days before release day, I finish GTA V and get to writing the review. This is the final screen you see after you finish the game. September 30: I attend an official GTA V concert. In a church. Weird, but cool. October 15: Some of my favorite things. October 25: Assassin's Creed IV isn't out yet, but I'm playing an early copy for a review. With so few people on, it's rather easy to find the ultra-rare, social-networked white whale. November 6: On Houston Street, right around the corner from Rockstar, sign painters are painting a new sign for GTA V.
November 11: Our notoriously broken—but later fixed—PS4. Our problem turned out to be minor, but serendipitously got me ahead of the curve in hearing about more substantial, if relatively rare, early hardware problems. November 18: Here's an odd one. I was watching live TV (for once) and an Xbox One commercial ran. My cable signal was passing through my Xbox One. Wouldn't you know it... when the announcer in the commercial said, "Xbox One," my console snapped to attention. I rewound my DVR and tried to make it happen again. In four more tries, it only happened once. Weird. I did catch it on video, which is what you can see here. It didn't happen consistently enough to seem like a story. November 23: I finished the new Zelda! Great game. Share any of your own pictures from your gaming year below. And take it away, Parappa!